Wednesday 4th March: Daily technical outlook and review. Weekly Timeframe: The weekly timeframe shows that the buyers and sellers are currently battling for position just above a major weekly Quasimodo support level at 1.1109. Daily Timeframe: Similar to the weekly timeframe, the daily timeframe shows price hovering just above a daily demand area coming in at 1.1045-1.1127, which, if you look back to the weekly chart, you’ll notice that it surrounds the aforementioned weekly Quasimodo support level. 4hr Timeframe: Recent developments on the 4hr timeframe reveal that price is currently bouncing between the 1.1167 level, and the 1.1200 handle. Given that both the weekly and daily timeframes are showing near-term support coming in just below (see above), our team has decided to put sells on the back burner for the time being and focus our energy on looking for buy trades. The buy zones currently on our watchlist at the moment are 1.1150, and 1.1109. 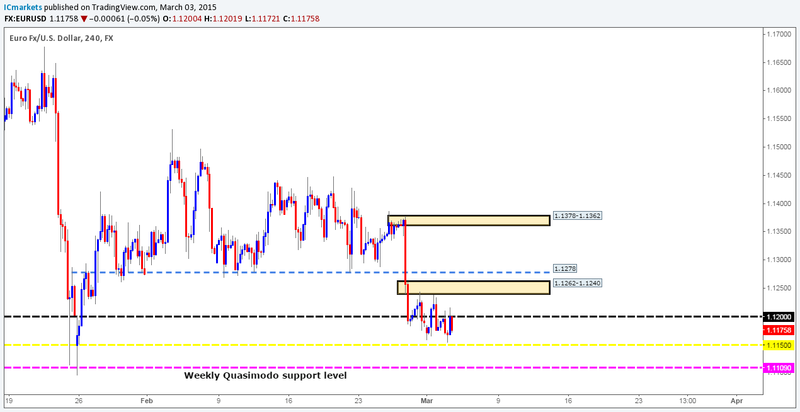 Selecting the weekly Quasimodo support level at 1.1109 is, we hope, self-explanatory, but why 1.1150? Located 20 pips or so above the aforementioned daily demand area. Weekly open level seen back on the 25/01/15. Touch trading these levels would be too risky in our book, since a fakeout would likely stop us out. A more conservative approach would be to keep an eye on the lower timeframe price action, if we see a 15 minute timeframe supply area engulfed, for example, this would then be a signal to begin looking to touch trade near term demand. Buy orders: 1.1150 [Tentative] (Predicative stop-loss orders seen at: dependent on where one confirms this level) 1.1109 [Tentative] (Predicative stop-loss orders seen at: dependent on where one confirms this level). Weekly Timeframe: The weekly timeframe shows that price is currently trading around a weekly swap area seen at 1.5426-1.5561. Further selling from here could effectively bring the GBP down to a weekly swap level coming in at 1.5270. Daily Timeframe: As you can probably see, before further selling can take place on the weekly timeframe, the sellers will need to take out a small daily swap level coming in at 1.5351. 4hr Timeframe: The 4hr timeframe shows that price is currently trading within a 4hr demand area seen at 1.5331-1.5384 (encapsulates the aforementioned daily swap level). Buying the GBP here is not really something we’d consider to be high probability for two reasons. Firstly, buying into potential round-number resistance seen above at 1.5400 could put you into serious drawdown, or worse, a loss. And secondly, let’s not forget that price is currently trading from a weekly swap (supply) area at the moment (see above). It always pays to keep an eye on the bigger picture! With that being said, if this 4hr demand area is consumed today, the path south will then likely be free down to at least the 1.5300 level, which, if you remember from the weekly timeframe, is only 30 pips above a major weekly swap level at 1.5270. So, for anyone considering selling the breakout, do remember this important point! Buy orders: Flat (Predicative stop-loss orders are seen at: N/A). Sell orders: Flat (Predicative stop-loss orders are seen at: N/A). Weekly Timeframe: For the past four weeks, price has been trading, or should we say ‘lingering’ above a weekly demand area at 0.7449-0.7678. Should a rally be seen here this week, weekly resistance (as far as we can see) is not expected to come into the market until around the 0.8064 region. Daily Timeframe: At this point in time, the buyers and sellers continue to consolidate between 0.7844, and 0.7619. A convincing close above here could force the market to test a daily supply area seen at 0.8050-0.7994 (seen just below the weekly swap level 0.8064). A close lower on the other hand, would likely attract further selling down towards a daily demand area coming in at 0.7449-0.7598 (located deep within the aforementioned weekly demand area). 4hr Timeframe: For those who read our previous report on the Aussie, you may recall us mentioning to watch for confirmed buying opportunities around the 4hr demand area at 0.7738-0.7764. This area, as you can see, saw a beautiful reaction and has already hit two of our pre-determined take-profit targets, 0.7800, and the daily swap level 0.7844. A 4hr close above this daily swap level would likely open the doors for price to test 4hr supply coming in at 0.7905-0.7881, which, if you remember, is the final take-profit target for any longs taken from the 4hr demand area. Taking into account all of the above, short-term buy trades up to the aforementioned 4hr supply may be possible if price closes above and retests the daily swap level. Similarly, if the market closes below and retests 0.7800 as resistance, short-term selling down to the aforementioned 4hr demand could be something to consider taking part in. Weekly Timeframe: The weekly timeframe shows that price is currently trading around the upper limits of a weekly symmetrical triangle formation (121.83/117.43). A convincing close above this limit would likely encourage follow-through buying up to the weekly Quasimodo resistance level coming in at 122.18. (This triangle has been adjusted to fit recent price movements). Daily Timeframe: Recent developments on the daily timeframe show price trading just below a daily resistance level seen at 120.45.This level, as far as we can see, remains a key obstacle to a move towards a daily supply area visible at 122.61-121.54, which, if you look back to the weekly chart, you’ll notice that this area surrounds the aforementioned weekly Quasimodo support level. 4hr Timeframe: From the 4hr timeframe, we can see that price rebounded beautifully from 4hr supply at 120.36-120.00, consequently forcing the market south down to a 4hr swap level seen at 119.40. Buying from this level, even with lower timeframe confirmation, is not really what we’d call high probability, simply because you could potentially be buying from higher-timeframe opposition (see above). With that being said, a close below 119.40 would effectively be our cue to begin watching for price to retest this number as resistance, since the path south would then likely be clear down to at least the 119.00 handle. Weekly Timeframe: The weekly timeframe shows that price is still being held lower by a weekly Quasimodo resistance level at 1.2765. If further selling is seen from here, price will likely hit the weekly swap level coming in at 1.2260. On two occasions price broke below this zone (03/02/15 – 17/02/15), and has, as a result likely weakened the buying pressure here. Each time price hit this area, we can see that the buyers were clearly not strong enough to form a higher high, which, like above, indicates weak buying. 4hr Timeframe: The USD/CAD pair is currently ranging between 1.2533 and 1.2447 on the 4hr timeframe. A close above this range could very well force the market to test the 1.2600 handle. A close lower on the other hand, would likely clear the path south for further selling down towards a 4hr swap level coming in at 1.2379. That being the case, a close above 1.2533 would effectively be our cue to begin watching for price to retest this number as support. Buying the retest (with confirmation) offers a 60-pip profit target up to 1.2600. In the same way, if price closes lower, we’ll then watch for price to retest this level as resistance, and, if a retest is seen, attempt to short (with confirmation) down to the aforementioned 4hr swap level. However, in shorting here, one needs to be prepared for the possibility that price may find support around 1.2424 since this is considered demand, albeit minor, but still demand nonetheless. Weekly Timeframe: Last week saw price close just (by a pip) above a weekly swap level at 0.9529, which has, at the time of writing, clearly attracted further buying. In the event that the buyers can continue with this tempo, price will very likely hit another weekly swap level coming in at 0.9746 sometime in the near future. Daily Timeframe: The daily timeframe on the other hand, shows that price is currently trading within a rather large daily swap area seen at 0.9552-0.9656. In our opinion, this area remains a key obstacle to a move towards the weekly swap level just mentioned above at 0.9746. 4hr Timeframe: The latest coming from the 4hr timeframe shows that price has closed above the 0.9600 handle, and is, at this point in time, seen retesting it as support. In the event that the buyers manage to hold out above this level today, we can very likely assume that further buying will be seen up to the 4hr swap level at 0.9650. 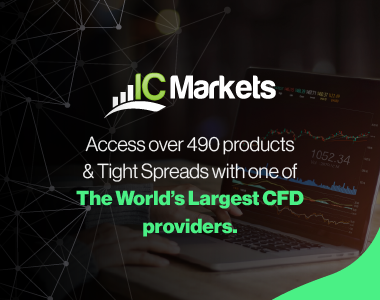 With the above taken into account, our team has come to a general consensus that buying may be the best path to take today. However, let’s not forget that buying from 0.9600 would also mean that we’re effectively entering long into a daily swap supply area mentioned above at 0.9552-0.9656. Therefore, any trades taken here will need (for us anyway) lower timeframe buying confirmation, and strict trade management rules. Targets for this trade are 0.9650, and, given enough time, the round number 0.9700. Buy orders: watching for lower timeframe confirmation around 0.9600 (Predicative stop-loss orders seen at: dependent on where one confirms this level). Weekly Timeframe: The weekly timeframe shows that price is currently trading above the recently broken high 18098. This number should, in our opinion, provide a supportive base for the DOW should a retracement be seen. Daily Timeframe: We can see from the daily timeframe that price is currently being supported by a small daily decision-point demand area coming in at 18056-18130. This area is, as far as we can see, the last line of defense protecting the 18098 weekly swap level. A break below here would likely open the doors for further downside towards the 17896 daily swap level. Weekly timeframe outlook is for the time being relatively positive (see above). The daily timeframe shows that support is currently being seen in the market (see above). The push above the 18242 high has likely consumed traders (sell orders) attempting to short at this level, thus potentially clearing the path north for further buying. On a side note, for those who read our last report on the DOW, you may remember we said that if 18242 did not hold, we’d liquidate most of our current long position from 18109. This is exactly what we did. There is now a small position running with the stop set at breakeven. Buy orders: 18109 [Live] (Predicative stop-loss orders seen at: presently set at breakeven) 18148 [Tentative] (Predicative stop-loss orders seen at: dependent on where one confirms this level). Weekly Timeframe: From the weekly timeframe, we can see that price is currently capped between a weekly swap level coming in at 1222.2, and a weekly demand area seen at 1166.8-1195.0. Daily Timeframe: The latest coming in from the daily timeframe shows that price (similar to the weekly timeframe) is currently capped between the aforementioned weekly swap level and a small daily swap level seen at 1200.0. A close above here would likely force the market to test a small daily supply area at 1236.6-1227.7. On the other hand, should a close lower be seen, further selling would likely take place down towards a daily swap level coming in at 1182.0. Buy orders: 1198.1 [Tentative] (Predicative stop-loss orders seen at: 1189.3). Sell orders: 1217.0 [Tentative] (Predicative stop-loss orders seen at: 1226.0).